Each year Motor Magazine selects the Top 20 most innovative new tools in the automotive industry. 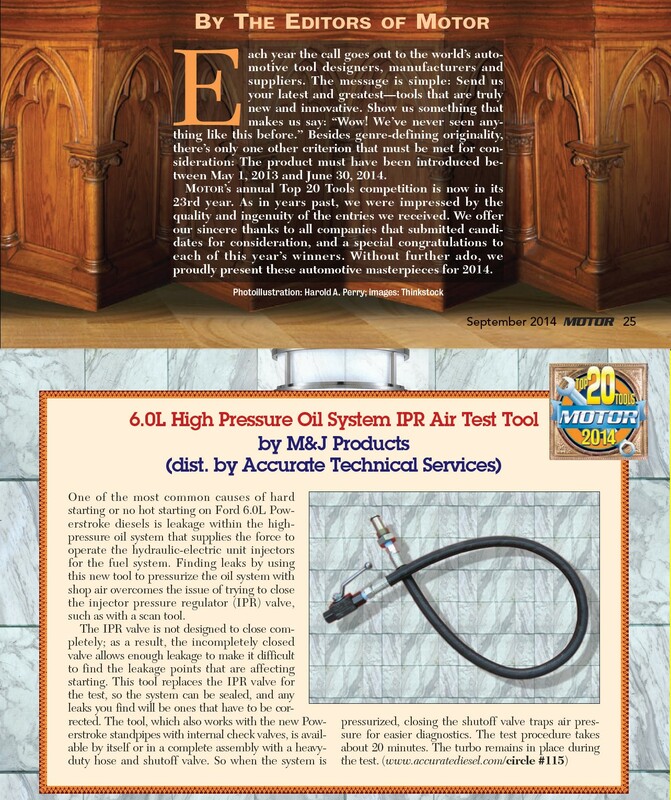 We are pleased to announce that our 6.0 IPR Air Test Tool was selected to receive this highly coveted award for 2014. Click HERE to see a clip of the Motor Magazine article. One of the more common issues plaguing 6.0L Powerstroke owners are hard hot-start issues. These issues are almost invariably caused by leakage in the engine's high pressure oil system which operates the fuel injectors. Possible leakage locations include the high pressure oil pump itself, IPR Valve, STC fitting, branch tubes, standpipes, dummy plugs, oil rail ball tube o-rings, injector inlet seals, etc. If the leak or combination of leak sources is bad enough to prevent the system from building the 520 PSI required, the truck will not start under any condition - hot or cold. Locating the exact source of the leak(s) is the challenge. The method most technicians use to locate the source of the high pressure oil leak is to connect shop air to the high pressure oil system by way of an adapter which takes the place of the ICP sensor. This method has several problems associated with it. First, the IPR valve is normally open and must be closed by either commanding it closed with a scan tool, or by using a stand-alone IPR driver tool or no air pressure will build in the system. (Connecting battery voltage directly to the valve will damage it.) Even when commanded closed, IPR valves are not designed to seal completely meaning that they will always leak some air during the testing process. Unfortunately, the sound of one air leak will make it difficult or impossible to locate other leakage points - especially small leaks toward the rear of the engine such as cracked branch tubes. Finally, the latest updated standpipes have internal check valve which prevent reverse flow - rendering the conventional test method useless. We have teamed with an innovative local company to bring you a new and improved method of locating these troublesome leaks. Our Powerstroke ICP air test fitting tool takes the place of the IPR valve meaning that the system can be completely sealed so that even the smallest leaks can be detected. 2. Leaks of ANY size can be detected - because the IPR valve is removed from the system the fact that it never closes 100% and thus creates a distracting air noise during testing becomes a non-issue. In fact, it is possible to pressurize a system with shop air, close the shutoff valve on the tool, and leave the system pressurized overnight. We have seen systems that will hold the pressure until morning. 4. Allows systems with the latest updated standpipes to be tested. These Powerstroke ICP air test fitting tools are built to last a lifetime with professional grade components. They are constructed 100% in the USA (with the exception of a high-quality German made shutoff valve). The heavy-duty Eaton hydraulic hose is rated up to 5,300 PSI. Each 6.0 IPR air test tool includes three extra O-ring sets for the IPR fitting. 1. Complete tool with IPR replacement fitting, heavy duty hose, and shutoff valve assembled - Most professional technicians who do a lot of work on the 6.0L Powerstroke should choose this option. The ability to 'air-up' the system and then trap the air pressure by closing the shutoff valve allows even the smallest leaks to be detected. The absence of any unwanted air noises from leaking air lines connected with quick connect couplings makes locating the real problem easier. 2. IPR replacement fitting only - This cost-saving option is intended for lower volume users such as individual truck owners. At less than the cost of one hour of diagnostic time in most areas, this tool can save you hundreds or even thousands of dollars. - The complete system can be tested in under 20 minutes with this 6.0 Powerstroke ICP Air Test Fitting tool - in a professional repair facility this tool will pay for itself after one or two repairs. To connect, just remove the air cleaner, FICM, and coolant degas bottle (Turbo removal is NOT required). Remove the IPR valve and thread in the tool, hand tightening using the hose is sufficient. - Connect shop air and listen for leaks. To locate the smallest leaks close the shutoff valve on the tool to seal the system. If desired a scan tool can be used to monitor air pressure in the system by observing the ICP sensor reading. This is not a required step. - To prevent costly combacks we recommend air checking every 6.0L for high pressure oil leaks after any part of the system has been disassembled. - Click HERE to see pictures of the tool in operation. - As with any air tool, you will need to add your own air line quick-connect fitting. Since there are so many various air fitting in use, it is impractical to provide this part. Our tool has 1/4 inch pipe threads to accept standard air fittings. - It is strongly advised to avoid cranking the engine with this tool connected. Since the IPR valve is not in place to provide pressure relief, the high pressure oil pump would effectively be dead-headed and pump, system, tool, or personal damage could result. - Auto repair activities are hazardous. Always wear protective eye-wear. This tool is intended for usage by trained professionals. By using it you are certifying that you have the necessary skills and training to do so safely. We carry the repair parts you need. See related items below and the 6.0L category of our website. Special offer: Add a 7.3L fitting to your tool and save $10 versus buying separately. Select option below if desired.